Strong flexible ankles help you to walk in high heels. Whether a pump, sandal, stiletto or wedge, for many women high heels represent more than just a simple pair or shoes; rather, they are a fashion statement. But eventually the wear and tear of being fashionably forward can cause stress on your ankles. Add running or other physical activities to the mix and your poor ankles will be begging for mercy. One way to keep your ankles strong and flexible is to properly warm them up before working out. Go for a five- to 10-minute walk on the treadmill, around your neighborhood or through the park, depending on where you will be working out. 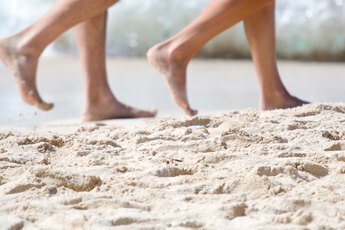 As the connection between your feet and legs, walking helps to loosen the ankle joint and increase the temperature in the supporting muscles. Start slowly and gradually build your pace. Add inclines, hills or stairs after five minutes if your ankles are feeling loose and flexible. Increase your pace to a light jog for the last two to three minutes of the warm-up. Perform 20 to 40 ankle circles on each leg. Elevate your foot off of the ground through either sitting in a chair, standing and balancing on one leg or lying on your back and lifting your leg into the air. Focus on one ankle at a time. Rotate the foot clockwise for 10 to 20 circles and then counter-clockwise for another 10 to 20 circles. Perform the circles in a slow, controlled manner. Repeat on the other ankle. Complete ankle flexion exercises on each leg. Sit on the floor with your legs stretched out in front of you. Wrap a resistance band around the ball of one foot, with the ends tied to a secure object, such as a sofa leg. 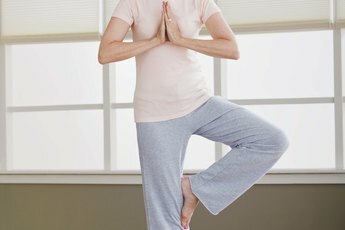 Slowly pull your toes toward your shin in a flexed foot motion and then point your toes. Complete a full set of 10 before switching to the other leg. Avoid overdoing the warm-up exercises to the point where you feel fatigued. Mild sweating may occur, but the warm-up should prepare your ankle joint and muscles for activity rather than causing them to become tired. Seek the advice of a physician if you feel pain or discomfort in your ankles when warming up.